A man rushed into hospital with a lung condition has spoken of his gratitude after a health care assistant stepped in to look after his dog. Jenny Wilson, who works at Hull Royal Infirmary, offered to look after Nigel Sutcliffe’s Staffordshire Bull Terrier Bruno after hearing how the dog would be distressed going into kennels. Nigel said: “As soon as the staff heard I’d a dog and I was worried about him, everyone was really helpful and nice. “I couldn’t believe it when Jenny said she’d have him. It was a weight off my mind knowing Bruno was being looked after. 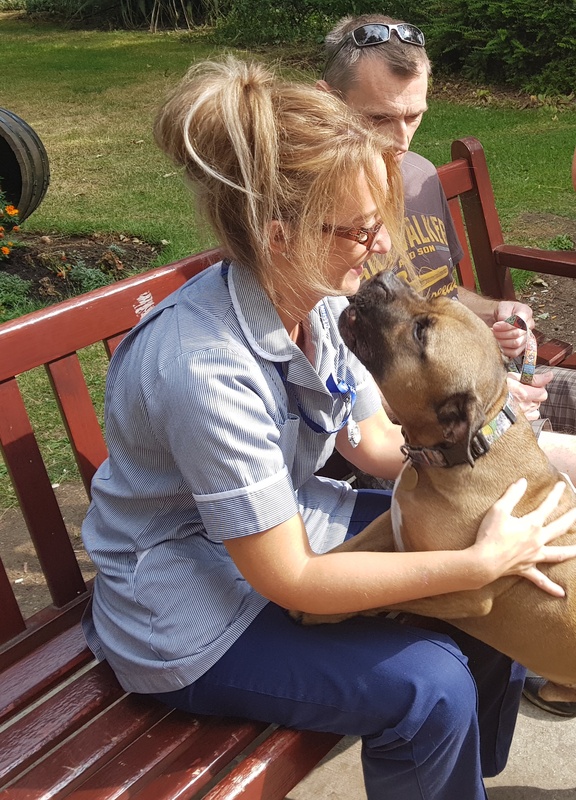 Bruno the Staffordshire Bull Terrier reunited with health care assistant Jenny Wilson from HEY Hospitals NHS Trust on Vimeo. Jenny was on a 13-hour shift on Ward 5 when Nigel was brought in with a pneumothorax, also known as a collapsed lung when air builds up between the outside of the lungs and the inside of the rib cage. She said: “He was quite worried about his dog and was asking if we could get in touch with social services so the dog could be put in kennels. “But he said the last time the dog had been in kennels when he was in hospital before, he’d been upset. Nigel said: “When I’d been in hospital before, social services had helped me get Bruno into kennels but when I’d call to check on him, staff told me he was quite stressed and had cut all his paws and face on the metal fence trying to dig his way out. “I felt like the last thing I wanted to do was put him into kennels again but I didn’t think I had any option. But as soon as I told the staff in the hospital about him and what had happened, people were trying to help me. Grateful of Jenny’s offer, Nigel arranged for his friend to meet Jenny at his home at the end of her shift to introduce her to Bruno and she took him back to her own home to meet her 15-year-old daughter Alysha, twin sons Owen and Declan, both 12, and her partner Amy. “They absolutely loved having him and couldn’t wait to take him out for walks,” said Jenny. “The dog loved the kids as well. 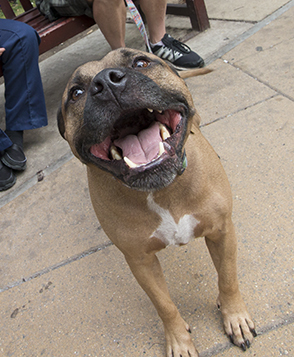 After four days, Bruno was reunited with his owner. However, they all still keep in touch. Jenny was nominated in Hull University Teaching Hospitals NHS Trust’s staff awards known as Moments of Magic by Patient Discharge Assistant Ashleigh Jaffray.